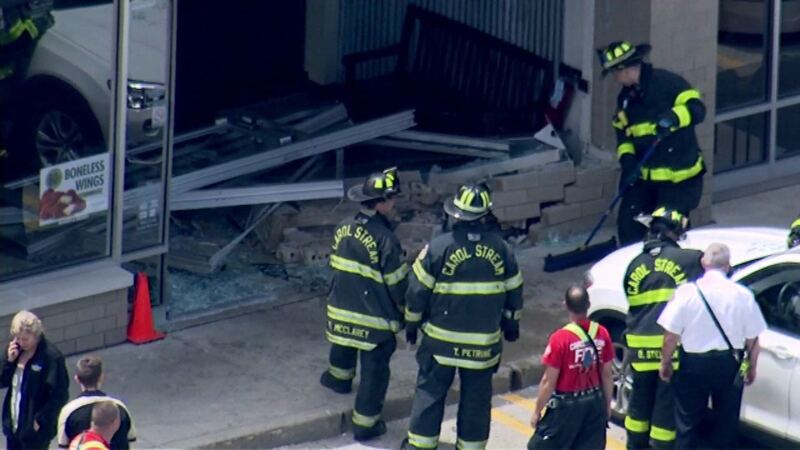 CAROL STREAM, Ill. (WLS) -- Fire crews were on-scene at a Wingstop in suburban Carol Stream after officials say a car drove through the front of the restaurant. Fire crews were on-scene at a Wingstop in suburban Carol Stream after officials say a car drove through the front of the restaurant. A BMW allegedly jumped the parking block and went through the restaurant's front window around 11:52 a.m. Friday in the 500-block of W. Army Trail Road. Police say the female driver of the car accidentally hit the accelerator instead of the brake. The man at the restaurant's counter suffered minor cuts and bruises from the crash, officials said. No other injuries were reported.